名古屋市昭和区の英会話スクールBigBowEnglishLab > ブログ > Nobody likes the licorice! Last month I took a once-in-a-lifetime trip to Wyoming and Yellowstone National Park with my family. Whenever I take a trip overseas, I always bring back some unique type of candy that cannot be found in Japan for my students. This time I brought back saltwater taffy. Saltwater taffy is a traditional American candy that is not very popular these days, but I have fond childhood memories of watching taffy pulling machines make taffy inside old-fashioned candy stores. As I predicted, the students opinion of taffy was mixed. Some students liked it, but most students thought it was strange. However, everyone liked asking me what the different flavors were. "Sensei, Is the yellow one banana? What flavor is the blue one?" they would ask me after class. 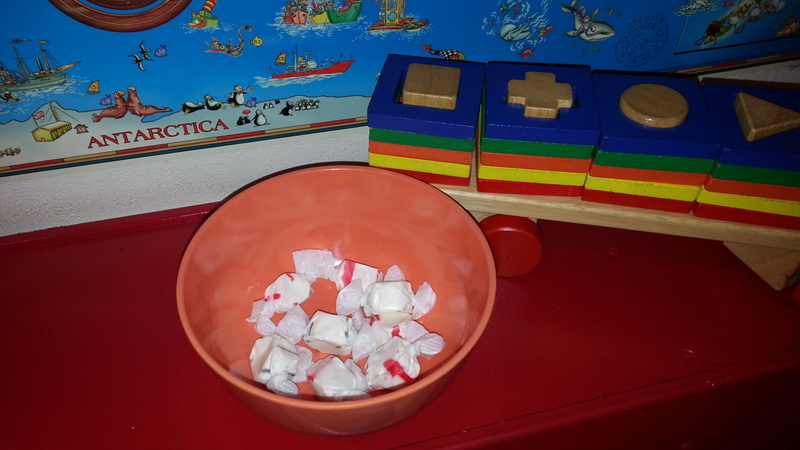 Now the bowl of taffy is almost empty and I laughed when I looked inside and saw that licorice and peppermint were the only flavors left. Peppermint is not popular in Japan and licorice is non-existent. Students would ask me what licorice tasted like, but when I couldn't explain, they decided to choose a more familiar flavor. Licorice and peppermint are the only ones left! Many years ago, my husband worked as an interpreter for the F-1 race when it came to Suzuka Circuit. The Japanese workers were passing around this candy they brought back from Italy. They told my husband, "You must try this strange candy. It has a horrible flavor!" My husband brought some home to me and asked me to try it. Imagine his surprise when I tried it, smiled, and exclaimed, "Oh, licorice!"